INTRODUCTION: The frontal eye field (FEF) receives converging inputs from many cortical areas, and may use visual representations in working memory to select targets for spatial attention. The decision to shift the gaze is seen as being dependent on two cognitive processes, the first being the allocation of visual-spatial attention, and the second being the actual response that moves the eyes. Studies of structures such as the frontal eye field (FEF) indicates distinct networks of neurons performing different functions. The FEF contains one type of neuron that participates in selecting the targets for orientation after the objects involved have appeared, and another type of neuron that prepares the execution of saccades. A third type of neuron in the FEF is capable of remaining highly active even after the stimuli that originally gave rise to the activity has disappeared. The FEF is a frontal brain region that receives converging inputs from many cortical areas, and these are also seen as contributing to the guidance of saccades. 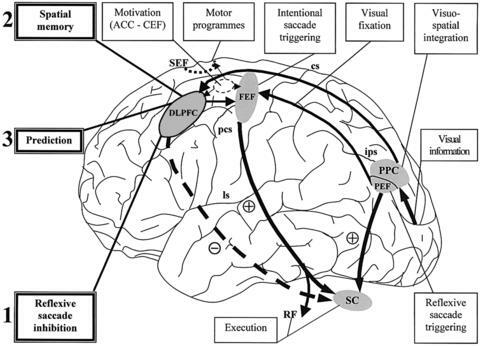 Working memory, associated with the process of the reasoning/planning of the dorsolateral prefrontal region, is viewed as playing a role by holding representations, while a visual search involving saccades is in progress. So perceptual attention is seen as being driven, at least in part, by visual working memory representations. The direction of attention is seen as being coded by the activity of particular neurons, notably in the FEF. The FEF is thought to have connections to both the dorsal and the ventral stream, and to muscles controlling the movement of the eyes. Attention is directed to locations where a chosen target is likely to appear. An increase in the number of distracters can delay the allocation of attention. This is suggested to account for variations in visual search efficiency. Attention appears to shift in a serial fashion between different possible targets until the actual target item is found. Several studies also suggest that visual attention is directed to the end point of a saccade before the saccade is made. Enhanced neural activity can be observed prior to the arrival of attended objects in the locations at which they are expected. In the initial stage of neural response to objects in the intended area, there is no discrimination between target objects and distracters, but at a later stage differentiation between targets and distracters is achieved. The hypothesis here is that the representation of visual stimuli in the FEF relates to the allocation of attention.